April 17th, the first full day of our Nemesis Bird Nature Tour to south Texas, brought us to the headquarters of Laguna Atascosa NWR. This vast refuge is one of the last homes for Aplomado Falcons and Ocelots in the United States, but our sights were set on hunting down a visiting rarity – the immature male Crimson-collared Grosbeak that has been hanging out near the Refuge Office for a few months. With a few other birders, we staked out the area that the grosbeak is typically found in. While we waited for the bird to show, a variety of other South Texas specialties put in their first appearances of the trip. A pair of Altamira Orioles were busy building a nest, a male White-tipped Dove was showing off to a female along one of the trails, male Bronzed Cowbirds were showing off to females, and Ladder-backed and Golden-fronted Woodpeckers called loudly from the trees around us. 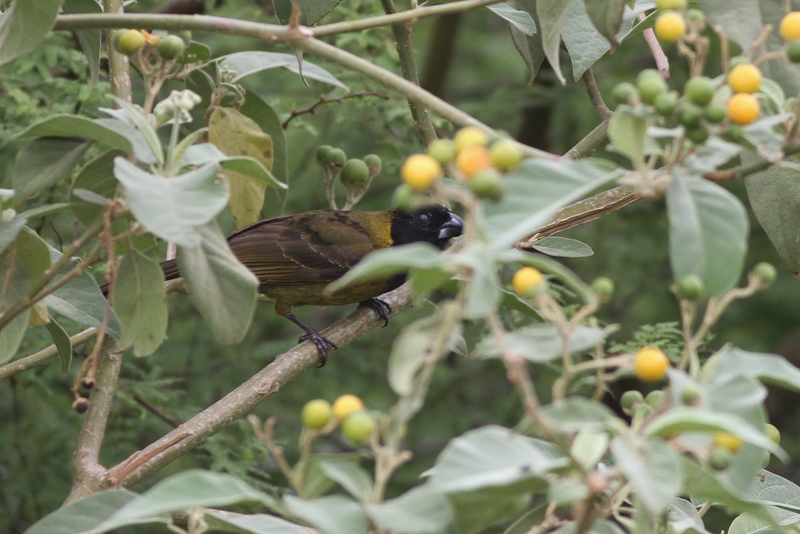 Brown-crested Flycatchers and Couch’s Kingbirds also put in good showings – both also heard calling to further confirm their tricky identifications. A female Rose-breasted Grosbeak popped up into view, just to taunt us for not finding the Crimson-collared yet! Luckily we only had a few more minutes to wait, and then our target bird magically appeared in the tangles of a row of potato trees. Crimson-collared Grosbeaks are endemic to northeast Mexico, and the adult males have stunning dark-red and black plumage; but almost all of the 20 sightings recorded in the US have been immatures or females. 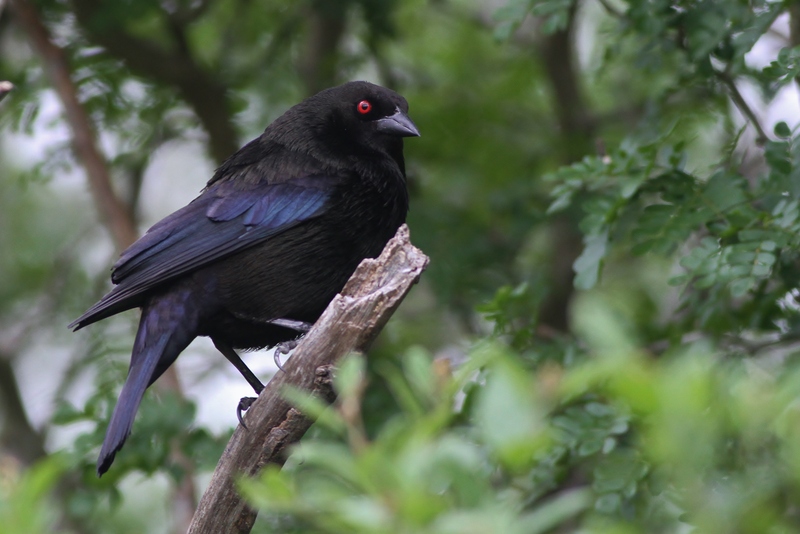 This bird was no different – an immature male with a dark-green body, full black hood, and a chunky, gunmetal-gray bill…not yet in its flashy ‘crimson’ plumage, but still uniquely different from any other songbird in the US. It was great to observe a species that was likely native to this region hundreds of years ago, and is now becoming and a more regular visitor to southern Texas as larger patches of habitats are conserved and reverted back to native vegetation and forest structure. This particular grosbeak was present at the refuge from January 25th, 2015 to April 25th, 2016. 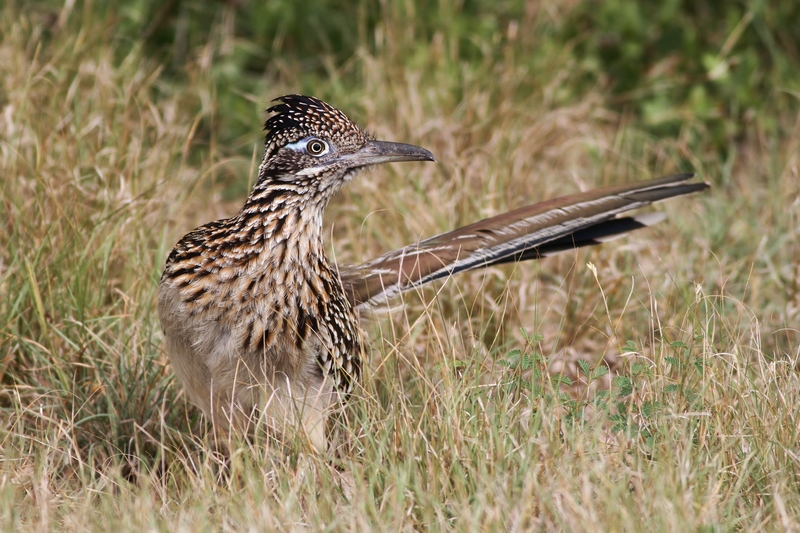 On the drive out of the refuge, we had great views of a female Greater Roadrunner standing along the side of the road – always a crowd pleaser! We ended the evening at the beautiful Atascosa Outlook Bed & Breakfast, watching over the Arroyo Colorado as hundreds of gulls used the river to make their way back to the coast for the night. This was an excellent opportunity to view the structural and plumage differences of Laughing and Franklin’s Gulls side-by-side. 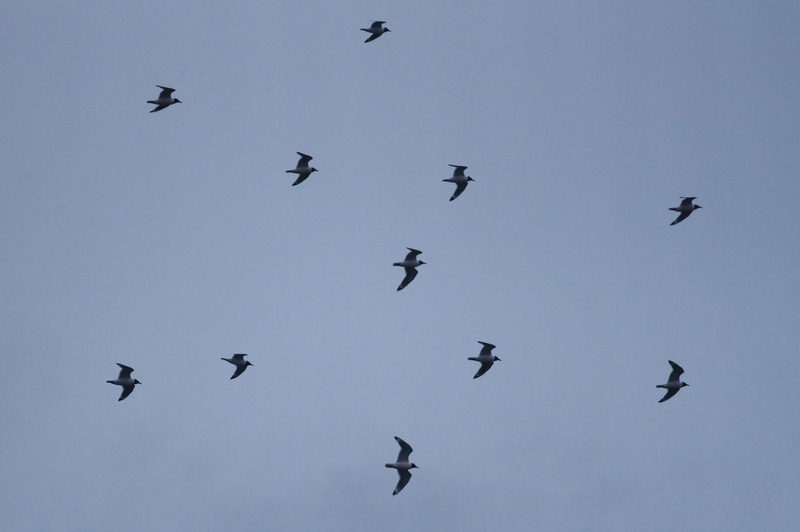 We counted nearly 3000 Laughing Gulls and 800 Franklin’s moving past, plus at least 70 Ring-billed Gulls and a few species of terns. Other notable sightings around the yard were a distant Green Kingfisher, a pair of Inca Doves, and flyovers from both Lesser and Common Nighthawks. After dark, a Black-crowned Night-Heron was fishing under the lights near the dock and a few Common Pauraques were calling across the river.